These totes are like none you’ve ever seen. Triple layers of cloth on the bottom make them nearly indestructible, and a waterproof taffeta lining keeps their contents clean and dry. They’re sized to be just right for carrying to and from the boat, with a handle long enough to sling over your shoulder. They have plenty of pockets on the inside for keys, sunglasses, and a magazine, and a zippered, gusseted pocket on the outside as well. Zipper top keeps contents dry and secure, and stays out of the way when not needed. 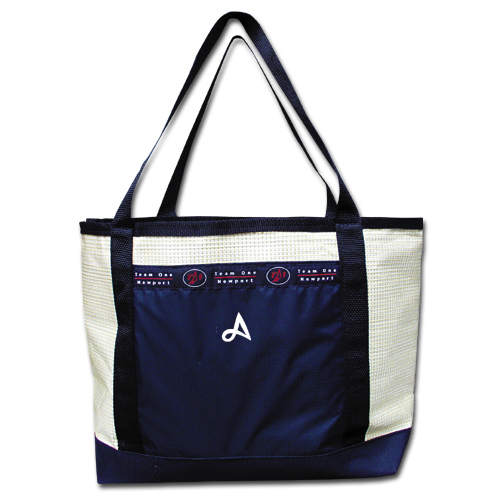 This tote has the Alerion Yachts logo embroidered above the pocket.